Moorfield Storey was a forerunner to Ron Paul: anti-war, pro-gold, and a strong proponent of civil liberties. He was the inaugural president of the National Association for the Advancement of Colored People (originally started by socially-conscious whites). He makes a good example of how strong but "hidden" Pallas can be the most powerful factor on the chart. Libertarian: Pallas septile Mercury and Sun and ruled by Uranus (which is conjunct Mercury and Sun) and by Saturn (which is novile Mercury). Authoritarian: very wide indirect conjunction between Uranus (co-ruler of Pallas) and Pluto. 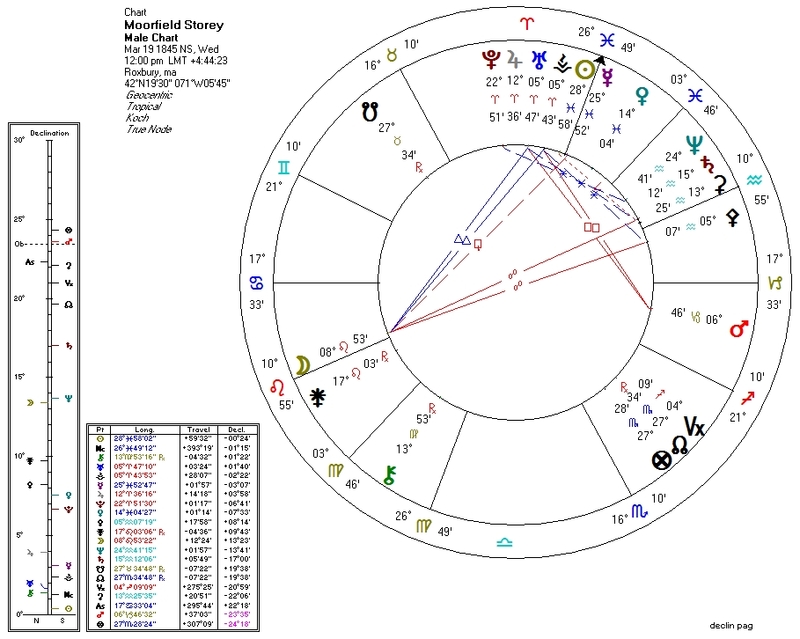 This is arguably a "perfect" libertarian chart because the Pluto influence is questionable, and Storey's record speaks for itself. For political charts, we normally look at economic and social factors, but in this case the lack of the birth time makes looking at these factors difficult. Frankly, Pallas is so over-the-top powerful in this case that she is likely to overwhelm any other political factors. Both Storey's career and his astrological chart leave no question as to his libertarian leanings.